Thanks to new technology developed by Philips, drivers can see and be seen like never before! X-treme Power headlamps project up to 80 per cent more light on the road ahead (depending on the type of head lighting unit used in the car). The light is powerful and intense, and the extra quality and quantity of light provided by X-treme Power lamps make them ideal for drivers who want their cars to stand out in a crowd, while ensuring driver and passenger safety is of the highest priority. DOT legal and come with the same quality and performance we put into the lighting we sell to OEMs around the world. 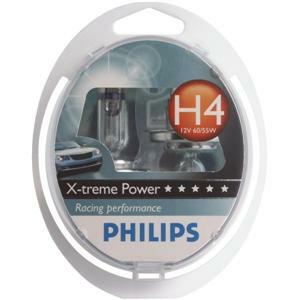 X-treme Power is a new “must-have” for motoring enthusiasts and high performance drivers. This is so new, we could not randomly select test samples, so can’t include it in our assessment. Yet performance of our pre production unit was staggering. Even compared with the current benchmark Plus per cent bulbs, the difference was immediate and dramatic. Philips claim an 80 per cent improvement over standard units, but we think that this is conservative. The results have been achieved in the same way as the 30 and 50 per cent lamps-by taking the allowed tolerances right to the edge. This time though as well as reducing the filament and burning it hotter, Philips has shrunk the glass casing. As a result, the gas pressure can be increased for better light output.Engineers have also optimised the geometry and shield position to focus the light where it is needed.